Tabasco sauce is a mass-produced brand of hot sauce made from tabasco peppers (Capsicum frutescens var. tabasco), vinegar, and salt, and aged in white oak barrels for three years. It has a hot, spicy flavor and is popular in many parts of the world. 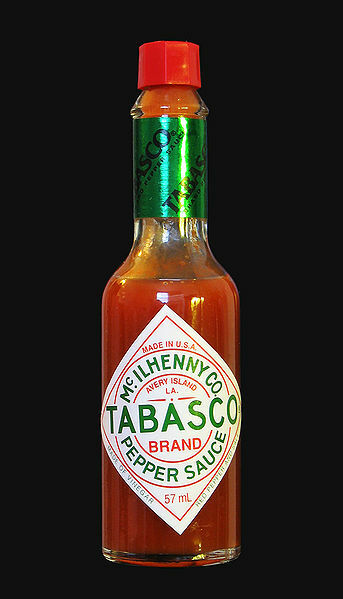 Tabasco is trademarked as the brand name for the variety of pepper sauce marketed by one of the United States' biggest producers of hot sauce, McIlhenny Company of Avery Island, Louisiana. Left: Classic Tabasco red pepper sauce. Tabasco sauce was invented in 1868 by Edmund McIlhenny, a Maryland-born former banker who had moved to Louisiana around 1840. Initially McIlhenny used discarded cologne bottles to distribute his sauce to family and friends, and in 1868 when he started to sell to the public he ordered thousands of new "cologne bottles" from a New Orleans glassworks. It was in these that the sauce was first commercially distributed, sharing till today a striking similarity to contemporary packaging for 4711 brand cologne. Today the company remains a privately held firm, presided over by Paul C. P. McIlhenny, sixth in a line of McIlhenny men to run the business. Until recently, all of the peppers were grown on Avery Island. While a small portion of the crop is still grown on the island, the bulk of the crop is now grown in Central and South America, where the weather and the availability of more farmland allow a more predictable and larger year-round supply of peppers. This also helps to ensure the supply of peppers should something happen to the crop at a particular location (such as a hurricane). Regardless, all of the seeds for all locations are still grown on Avery Island. Following company tradition, the peppers are hand picked by workers. To tell their ripeness, peppers are checked with a little red stick, or le petit bâton rouge, that each worker carries around. Those peppers not matching the color of the stick are not harvested. Peppers are ground into "mash" the same day they are harvested, placed in white oak barrels with a small amount of salt, and sent to warehouses on Avery Island for a three-year aging process. At the end of the aging process, the mash is drained to remove skins and seeds from the liquid. This liquid is then mixed with vinegar and stirred intermittently for about a month before being bottled as finished sauce. Much of the salt used in Tabasco production is acquired locally from Avery Island's own salt mine, one of the largest in the U.S.